For some people, especially those with creative tendencies, it can seem a scary concept to set up your own website. But I can assure you, even the least technical person can manage to create a basic author site. If you are familiar with using a search engine, you have all the skills you need. It really is as simple as following a few step-by-step instructions. By creating your own from scratch. WordPress.com is free but isn’t ideal. This, if you aren’t aware, is a content management system for bloggers and websites. Essentially, this means it lets you use a part of its network for your site and you can use their infrastructure without needing to worry about any of the technical bits and pieces that come with setting up a website. However, it is not without its downsides. One of the main problems is that when your website is on WordPress.com your name comes as part of the main address, for example, mine would be lizziejay.wordpress.com (except there’s one of those already and it isn’t me!). It looks far more professional if you have your own domain name and it really doesn’t have to cost a fortune. If you are really strapped for cash, then you could start off with a site here but be aware of the difficulty of changing your site name after you have found some followers. You don’t want to lose them because they can’t find you under your new name. If you have your own website, you are in control. You decide how it looks, what it does and what it’s called. Yes, it does cost and those costs rise depending on the popularity of your website. But as you are just starting out, you should be able to get it up and running for less than a couple of take-away coffees per month. As I said before, you don’t have to be a technical genius to set up your own website. It’s just a case of getting to grips with the unfamiliar names and following instructions. If you are technically minded or you are interested in learning there are many ways in which you can add whizzy bits (probably not a ‘technical term’ as such!) but for just a bog-standard author website, it can be very straight forward. The first thing you will need to do is to decide on the name of your website. This is your domain name and it’s how people will find you on the internet. Think if it in a similar way to a street address that allows people to find you in real life. As in a real-life street address though it needs to be unique and as you are using this to publicise yourself, it makes sense to use your name or the name you write by. However, you can actually use whatever name you like as long as it is not in use by someone else. For instance, the domain name for this website is Pocketread.co.uk but my author site is called LizzieJay.com because, well, that’s my name! If your name is already taken, then you could think about tacking ‘author’ or ‘books’ at the end. I was lucky and no-one had used the domain name I wanted but if they had, I could have tried LizzieJayAuthor.com instead or LizzieJayBooks.com. Your domain name can be bought from all sorts of providers but I have used both GoDaddy and 1&1* in the past and they are both very reliable and simple to use. You just tell them the name you want, they check that no-one else is using it and offer you a price along with ‘endings’. These are the bits at the end of the name ‘.com’ ‘.co.uk’ etc. You can choose your country specific one (.co.uk for me) or .com or anything else they are offering. As a rule, if people can’t remember your whole address they tend to try .com so this is often a good choice but it really is up to you. One thing you really need to be careful of though is unintentional inappropriateness. For example, the domain name of the American company that allows you to find talent agents and their clients is called “Who Represents”. Not a problem until you put the words together – www.whorepresents.com – oh dear! Just make sure you cast a critical eye over your chosen name before you hand any money over. The next stage is to find somewhere that looks after your website, called a webhost. Simply put, a webhost is a company that owns lots of computer-type boxes that are permanently connected to the internet. If you pay them a yearly fee, they will ‘host’ your website. Basically they will put it on their servers so that everyone else that is connected to the internet can see it if they want to. You can think of it as a shopping centre and they look after the shop front for your website. If the domain name is the name of your shop, then the webhost gives you access to the shop premises where you can put all your stock to sell. BlueHost* are great and very simple to use but 1&1* will also host your site for you usually with a special deal if you have bought your domain through them as well. Once you have placed your domain name on the webhost servers, then comes the time to design your pages. When you write web pages you will be using a language called HTML (hypertext markup language) and you can learn that – or cheat! (It is perfectly possible to set up a basic site without learning HTML but it can help to tweak things if you are interested.) If you prefer the cheating option, there are two main options – WordPress.org or using a WYSIWYG editor. Firstly, download WordPress.org onto your own domain and use its functionality to create your own blog. Note that this is different from the WordPress.com I mentioned at the beginning. You have none of the downsides of being restricted by use and you don’t need to know html. When you have downloaded WordPress then you just follow the instructions to get to the WordPress dashboard. Luckily, many webhosts already allow you to just press a button and it sets the download going for you. Once it has loaded, follow the tutorials to choose a theme and you can easily set up your first page. Alternatively, you can set up your pages using what is known as a WYSIWYG editor. 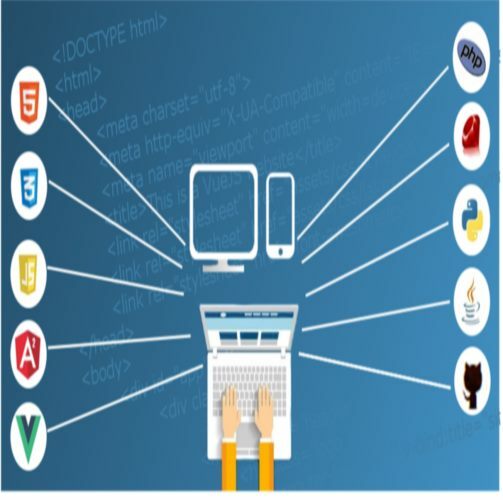 WYSIWYG stands for ‘What You See Is What You Get’, basically, a way of adding text and images or whatever it is you want to display on your pages and the editor turns it into HTML for you. If you want to pay for it, DreamWeaver has a good reputation but BlueGriffon is a good free alternative. When you first set up your author website all you need at the beginning is a single page. It can contain anything you like but one idea may be to introduce yourself, what you like to write and any books you have published. If you haven’t published any yet you can just say what you are working on, it all helps to cement in your own mind that there will be a time when your book will be published. Sometimes that can seem a long way off but this can spur you on when you have difficult writing days. A nice photo and some personal information about your other interests and that’s all you need. If you are stuck for ideas, have a look at some of your favourite authors and see what they have put on their ‘About’ page for inspiration. Just a few steps and you could be creating your own website. If you feel brave enough to give it a go, let me know how you get on or if there is anything I have missed. Next Post: Why set up an author website?